Peter Thiel has been overturning the furniture at nearly each stop of a current tour to promote his new book, Zero to One. An appearance this morning at a conference in Half Moon Bay, south of San Francisco, was no different. Thiel’s comments are sure to stir up discussion in tech circles, particularly after the excitement that Apple in particular has generated around its newest iPhones, its Apple Watch (expected early next year), and its highly anticipated mobile payment platform, which is reportedly being released in two weeks as part of Apple’s newest iOS update. The observations likely took the crowd by surprise, too. 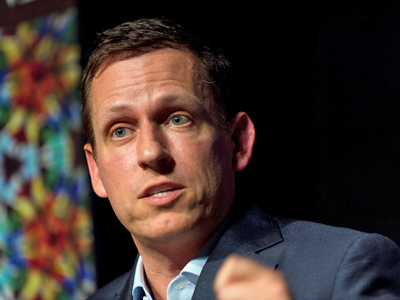 Earlier in the sit-down, Thiel had talked at length of being a “big fan” of founder-led businesses, including Google. “I think those that are not have a tremendous problem,” he said. He also called Apple the “paradigmatic” “zero to one” kind of company whose breakthrough technologies have repeatedly changed the world. Still, times change, he noted. Apple no longer has Steve Jobs at the helm. And while Thiel said he didn’t “want to take pot shots at [Apple CEO] Tim Cook” given the “impossibly big” shoes he has had to fill, Thiel suggested that Apple’s future now depends very much on how close smart phones are “to their final form,” as Apple is unlikely to produce anything revolutionary going forward. “If there isn’t much more to do with smart phones, it’ll be like marketing Coke and Pepsi and will produce [a lot revenue for Apple] for years to come,” said Thiel. Google’s former CEO and now executive chairman Eric Schmidt “was used to getting attacked from investors [for] spending money on flaky things,” said Thiel, but at least Schmidt was spending. Given that the company has done so little with its cash hoard despite a zero-interest rate environment, there’s little reason to believe it’s capable of much beyond iterating on its core search monopoly, suggested Thiel.